Lieutenant-Colonel Samuel Sharpe was one of two Canadian MPs who died as a result of his service during the First World War. But, unlike the other Member of Parliament, Lieutenant-Colonel George Baker, who was killed at the Battle of Ypres in 1916, Lt.-Col Sharpe wasn’t remembered with a statue in Parliament. The difference is, he didn’t die in combat. 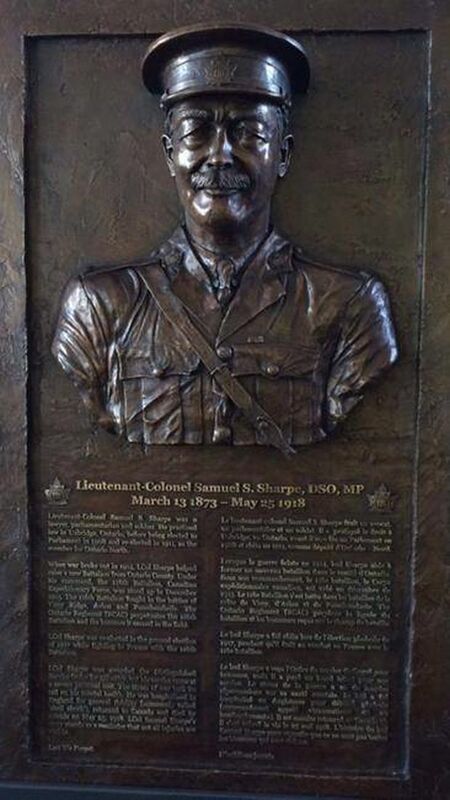 Now, almost 100 years after his death, the House of Commons is set to vote on whether to install a bronze plaque honouring Lt.-Col Sharpe in the Commons foyer, beside the statue of Lt.-Col. Baker. Conservative MP Erin O’Toole, the former veterans’ affairs minister who is spearheading the initiative, said he’ll be seeking unanimous consent from all parties for his motion on Thursday, in the hopes of paying tribute to Lt.-Col Sharpe’s life as well as recognizing the impacts of mental wounds on veterans. “We celebrate all these historic achievements and victories. We also have to look at the human cost here,” Mr. O’Toole said in an interview. Both Veterans Affairs Minister Seamus O’Regan and NDP critic for Veterans Affairs Gord Johns said they support the initiative. “Let’s see if we can do this, because I think it is important,” Mr. O’Regan said. Mr. Johns said the debate is not a partisan one. “We think that all Canadians deserve the opportunity to honour his incredible story and it’s sadly shared by many other veterans,” Mr. Johns said. Retired senator and Lieutenant-General Romeo Dallaire, who has been open about his battle with PTSD, has been working with Mr. O’Toole on a yearly mental-health breakfast named in Lt.-Col. Sharpe’s honour. It is not known exactly why a plaque was never installed in Lt.-Col. Sharpe’s honour. Mr. O’Toole believes prevailing attitudes of the day toward mental health and suicide may have led to him being forgotten, as well as the Parliament Hill fire in 1916, which closed Centre Block for a time. In 1920, the House of Commons commissioned a statue of Lt.-Col. Baker, which was unveiled in 1924. The plaque – which has already been created by artist Tyler Briley – has been in storage for almost three years. It was set to be unveiled by the previous Conservative government, but the project was sidetracked after the 2015 election was called. The Liberal government then created a commemoration advisory group to recommend where the statue should go. Mr. O’Regan said Mr. O’Toole approached him to make the case for keeping the plaque in Parliament. Mr. O’Toole hopes it will be in placed in the foyer for Remembrance Day and Mr. O’Regan suggested moving it to the Royal Ottawa Hospital, which recently announced a partnership with Veterans’ Affairs on a PTSD Centre of Excellence, during the planned decade-long renovations in Centre Block this fall. Lt.-Col. Sharpe, a lawyer, was first elected to Parliament as the member for Ontario North in 1908 and again in 1911. A year after Great Britain declared war on Germany in 1914, he organized the 116th battalion and began recruiting men in his riding. During the 1917 election, Lt.-Col. Sharpe was re-elected while fighting in Passchendaele. Mr. O’Toole, who will attend a ceremony marking Lt.-Col. Sharpe’s death in his hometown of Uxbridge, Ont., on Friday, said the soldier’s mental deterioration was evident in his letters home, where the guilt of losing his men proved too much. “Sadly, he ran out of hope. And there were no treatment options and some people looked down on the injury,” Mr. O’Toole said.